Considered one of the world’s most controversial artists, Michael D’Antuono is known for making art that challenges people to think more deeply about sociopolitical issues. His collectors range from Arnold Schwarzenegger to Pete Seeger and his work has received high praise from fellow artists Shepard Fairey and Banksy. What made you decide to dive into this sort of activist art? I inadvertently fell into it. When I left advertising, I started painting innocent portraits of iconic figures using symbolism and settings that best represented their image. 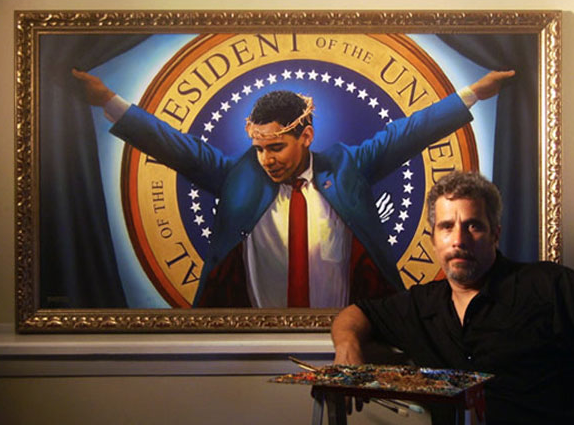 When I announced that I was going to exhibit an installation in Union Square of my painting of President Obama (wearing a crown of thorns) on his 100th day in office, all hell broke loose. The conservative media riled up the Religious Right, who then planned to bus protesters in from all over the country. I also received thousands of very angry and sometimes threatening emails. Concerned about my safety, my family pressured me into canceling the installation. I immediately regretted canceling the exhibit. I vowed that from then on, I would make the art I want to make and say what I want to say, never again allowing anyone to violate my first amendment rights just because they don’t agree with me. So I’ve been creating a body of work that speaks to the issues that concern me ever since. What has been the response to your work – in the media, in the art world, with the general public? Here are a few paintings from the show – can you tell us a bit about each one? 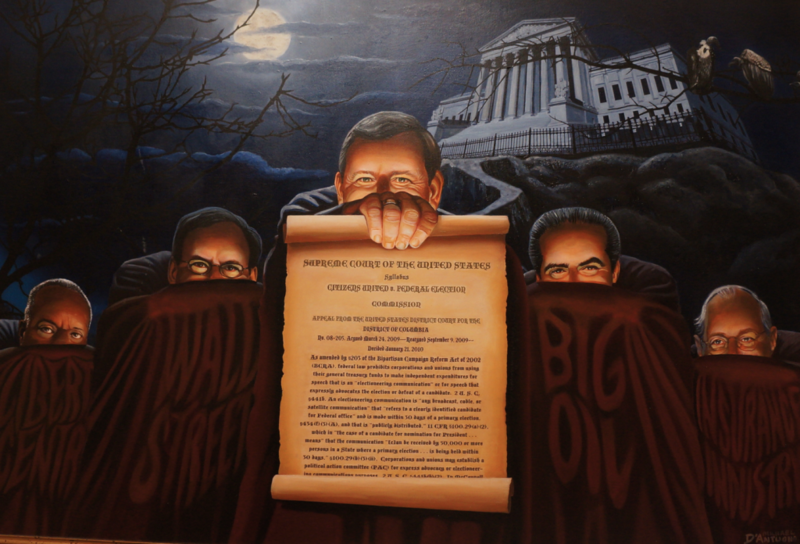 "The Citizens United ruling, the conservative Supreme Court’s decision to afford corporations the same first amendment rights as people, was in my opinion, the final nail in the coffin of American democracy. Now speech in this country is anything but free. Our elected leaders are beholding to the few billionaires with the money to finance ta campaign. We can thank the five conservative members who’s obscenely dubious interpretation of the constitution for ensuring America’s mutation from democracy to oligarchy. You may have noticed that in the folds of the judges’ robes reads the benefactors of their ruling." 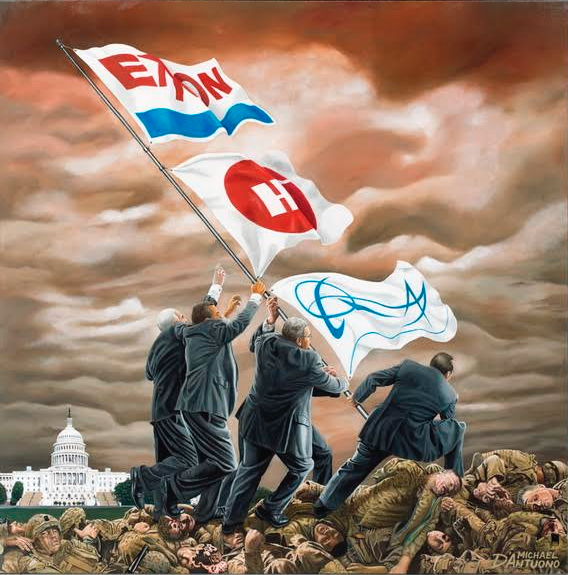 "This painting represents the unbridled greed and total disregard for the working class by the top rungs of the corporate elite. The title is an obvious twist on Occupying Main Street, signifying the total occupation by the 1%." 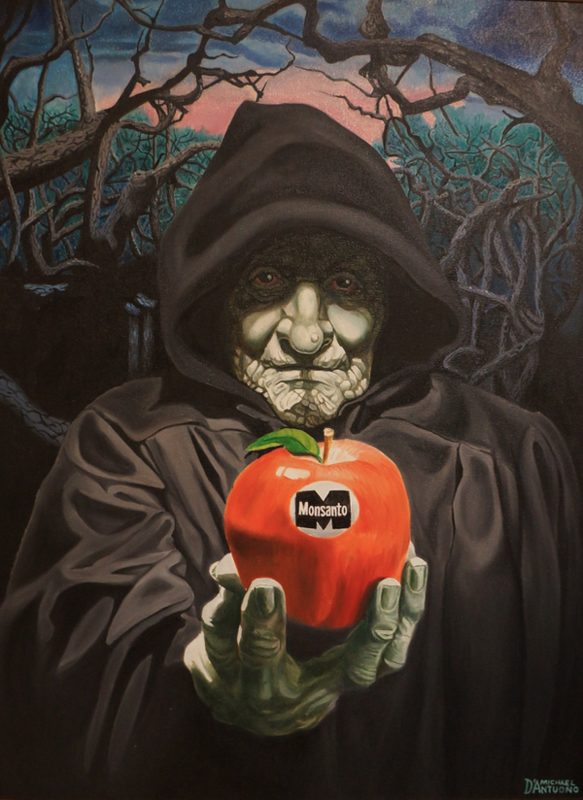 "As Monsanto has forbidden our elected leaders to protect us from, or even know if what we are eating are genetically modified foods, we are not any safer than Snow White was from her apple." Can you tell us about your eBay Zimmerman incident? I was enraged that George Zimmerman had the gaul to capitalize on his notoriety gained by killing an unarmed youth, by auctioning his first painting on eBay. It was reported that a Zimmerman fan bid $100,000 for the novice painter’s first attempt. As a show of support for victims over racist killers, I decided to auction my painting, “A Tale Of Two Hoodies” on eBay and donate half of the proceeds to The Trayvon Martin Foundation. On the second day of my seven day auction, Zimmerman’s came to a close, rewarding him with six figures. I was informed that the bids on my painting had already reached $25,000 and then $50,000. With five more days to go, I was sure to pass Zimmerman’s numbers, earning the foundation some funds and more importantly, proving that we live in a just society. Then I got a call from eBay telling me that they removed my auction for violating their policy of not promoting hate groups. I mentioned that my piece was anti-KKK, and in fact I was donating money to the foundation named in honor of the victim killed by the very man they just allowed to complete an auction, but they failed to see the irony or their own hypocrisy. They sidestepped my logic by telling me that my auction violated their strict policy of never selling any KKK related items. The next day, a fan asked me to type in KKK on eBay. When I did there were over 1,500 KKK related items. You can make of that what you will. Can you pick a few other works that are your favorites? "A cynical update of the iconic Iwo Jima Memorial photo, this painting (with a frame adorned with the dog tags of over 200 U.S. soldiers who died in Iraq before the reaching the age of 21) offers what I consider a more realistic explanation for America’s infatuation with war. Eisenhower warned Kennedy  about the military industrial complex over 50 years ago, and now we are in a state of endless war fought by those with no economic options for the profits of a few. Our defense spending is more than the next ten countries combined. And worse than the cost in dollars is the cost in lives. And for what? Could it be that America's self appointed role as the world's police, may be less about keeping America safe, than the earnings of defense contractors and oil companies?" "This painting explains why we do not have meaningful gun control in America. In the wake of Newtown, 44 senators disregarded the will of 90% of Americans who support universal background checks for gun buyers by not even letting a bill come to the floor. They willingly put more innocent lives at risk just to ensure that their campaign contributions from the NRA keep coming. This is the most blatant and egregious example of special interests subverting our democracy with great sums of money. The sole reason for the NRA’s existence is to lobby congress not to create any gun control legislation that might hurt gun & ammo sales no matter regardless of the cost in human lives. Only in America does the profits of gun and ammo manufacturer’s take priority over the safety of their citizens. The cause of death on the death certificates of mass shooting victims is usually listed as gun shot wounds, but that’s not the real cause of death. The real cause of death is greed. The greed of the gun and ammo manufacturers, the greed of the NRA, and worst of all, the greed of the politicians who take their money." 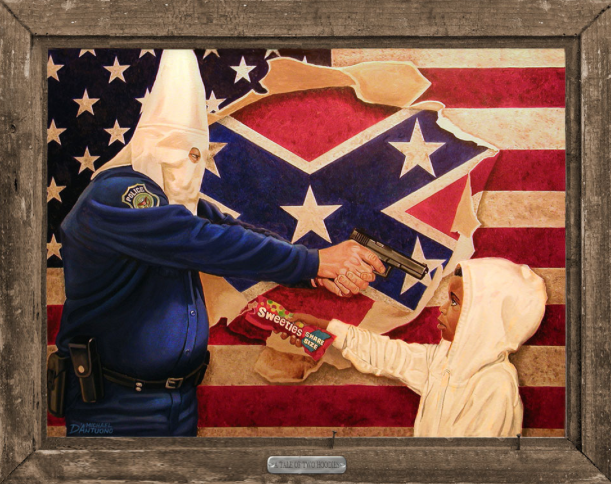 "This painting is a call to action which offers a solution of how the police can earn the trust of the black community. They say not all cops are bad, I hope this piece will embolden the “good cops” to break through the “blue wall of silence” because good cops don’t let bad cops kill unarmed citizens." What’s next, and how do you keep from despair? I am excited by a bunch of upcoming projects. In the area of institutional racism, I have been approached by a producer to develop a little film project based on my painting, “The Talk,” which we hope to have showings and town hall discussions at venues around the country. 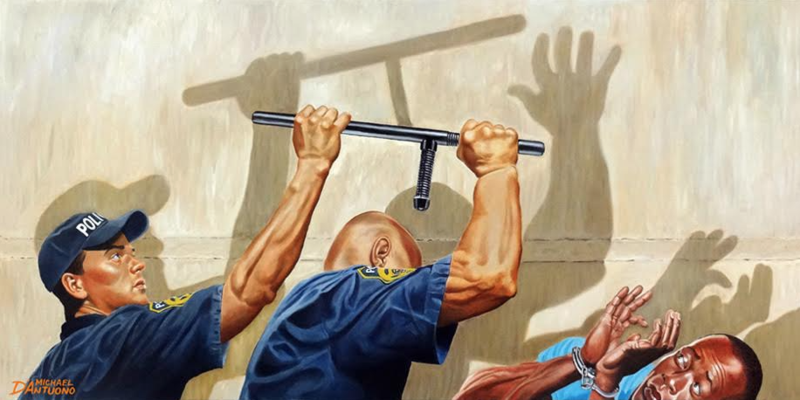 I will be giving out hundreds of posters and creating a large presence with my painting,“It Stops With Cops” at the Freddie Gray trial in hopes of directing the conversation towards the police’s propensity to put their sometimes misplaced loyalty to their brothers in blue above their duty to the citizens they are sworn to protect. 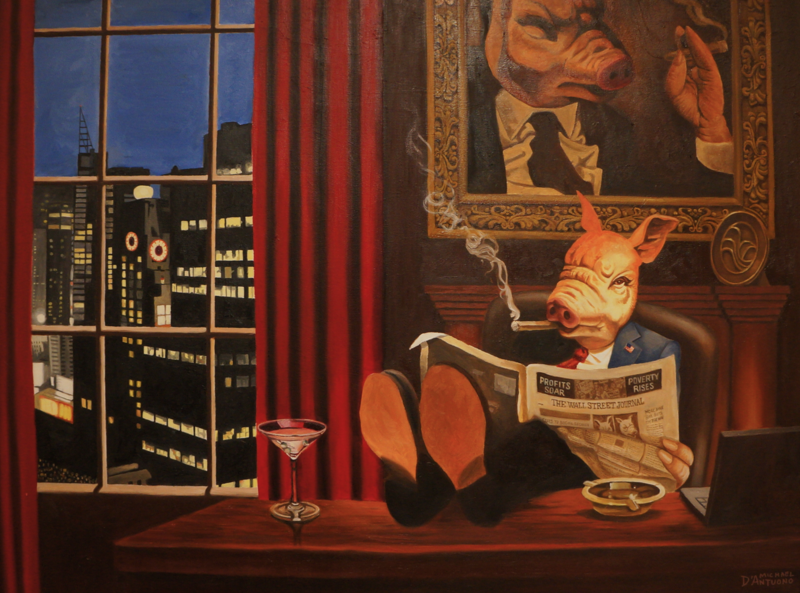 On the corporatism front, I will be exhibiting new pieces at the upcoming Manifest Justice and Politicon show. Despair thrives when there is helplessness. Staying active in the fight for social, economic justice is empowering. Of course, we have to accept that you can’t make everything right. The battle between the haves and the have-nots has been going on since time began. The best we can do is to do our best, rest up and resume the fight the next day. That said, we live in an unprecedented time when more is at stake than just human rights. A combination of greed, fossil fuels and overpopulation has created a perfect storm in which we are destroying the very planet we depend on for our existence. On second thought, we may all have to be a little more active with this one.